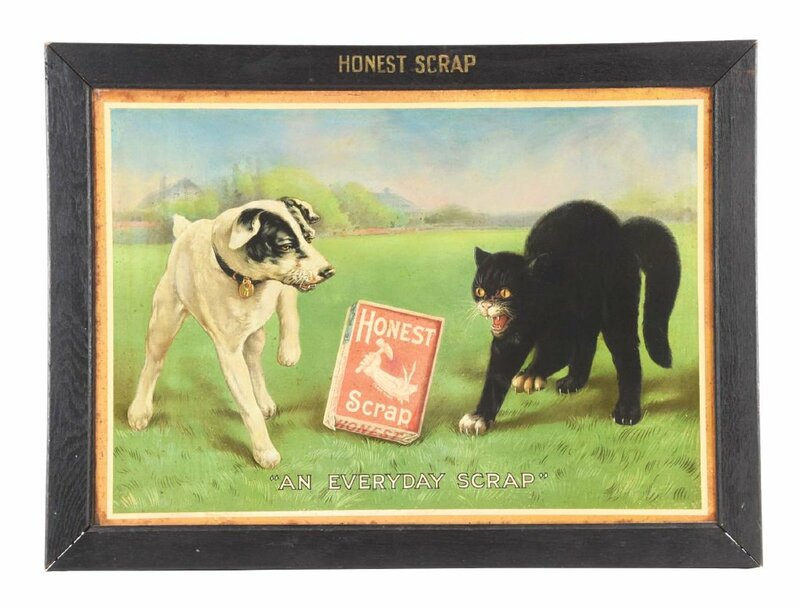 Featured is a great tin lithographic sign from the Honest Scrap brand of cut plug chewing tobacco. The image features a cap and dog in “An Everyday Scrap” as the caption reads. This logo was used on tin boxes and many other ads from this brand. This sign also comes in a cardboard lithograph also. Featured here is a great image of the Old Virginia minstrel or quartet dance stage group. These characters are dressed for a play, and are surely characters in the play given their unusual dress or costumes. 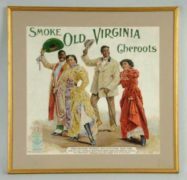 The Old Virginia Brand was one of the biggest selling tobacco brands for most of the 20th century era. Featured is a beautiful round tobacco tin can from the John Weisert Tobacco Company which was based in Saint Louis, Missouri. 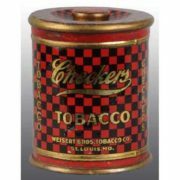 This can illustrates the Checkers Brand of tobacco, which was one of many brands the company made for years. This particular can is from about 1930. BAXTER’S DRUM 5 CENT CIGAR’S BEATS ALL WITH THEIR OWN DRUM! Featured is a beautiful small tin sign from the Royal Fruit Cigar brand. The sign advertises their brand as being 5 cts. per cigar. This sign is from the 1900-1910 era. Here’s a beautiful self-framed tin sign depicting the first mayor of Albany, New York, Peter Schuyler. He must have been so popular the G.W. Van Slyke & Horton Cigar Manufacturing Company in Albany made a cigar and named it after the cities former mayor. This sign is spectacular in color and clarity. Nic Nac Chewing Tobacco Tin Counter Display Can. Dominator Cigar Lighter and Cutter from M. Muller and Son in New York City. Quality Made Cigars! M-C-A 10 ct. cigar lithographic sign. Goldsmith, Silver Company, Boston, MA. Red Indian Cut Plug Tobacco Can. This tin is called a Knob Top Can. Made by the American Tobacco Company. Honest Long Cut Plug Tobacco Lithograph, Presidential Possibilities! 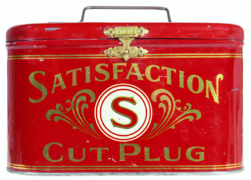 Featured is an early lunch box tin with a handle from the Satisfaction Cut Plug brand of tobacco.